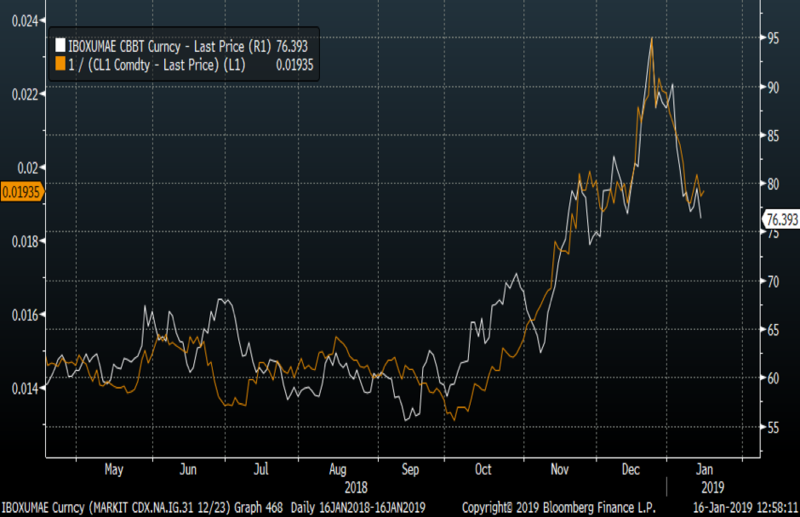 Dull Markets Killing Volatility – Time for the Contrarian Trade? The implosion in volatilities and other risk indicators continue. Some of the moves lower have actually been bigger than the moves to the upside we saw during the autumn turmoil. Needless to say, the crowd loaded up on max long volatility trades when volatilities exploded in late December. European vol index, the V2X, continues lower as index moves are practically not to be seen. Note the V2X hitting the 200-day average and trades at levels last seen in early November. VIX continues the implosion from recent highs above the 35 level as we trade down to 18 ish in pre-market today. Net non-commercial VIX futures (white) is still not updated for the year, but oh boy has this been a painful trade for people that don’t understand volatility. 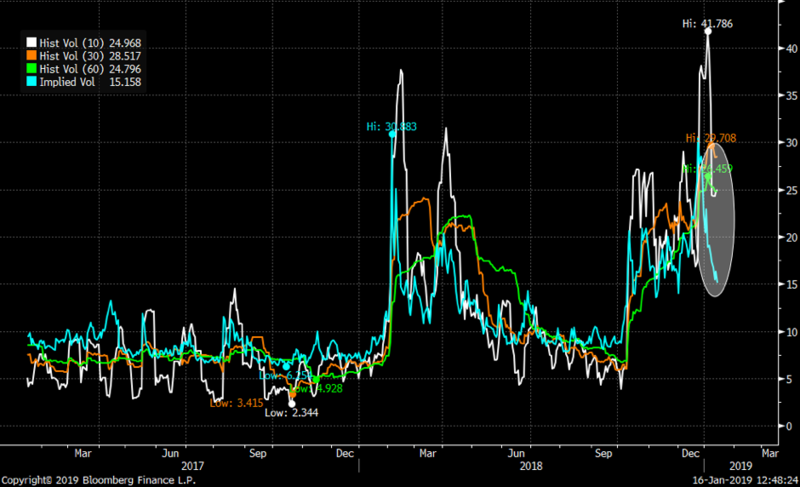 Investors bought max protection when VIX (orange) was the most expensive. We are eagerly awaiting the net non-commercial longs chart to be updated. 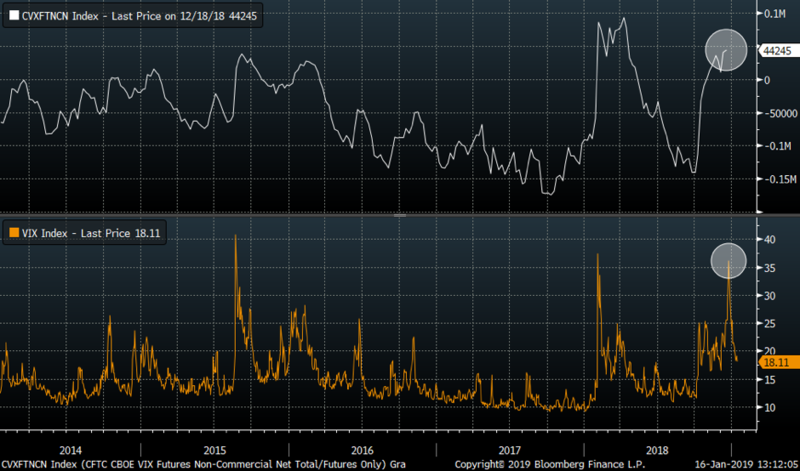 The blue line in the below charts shows SPX implied vol. 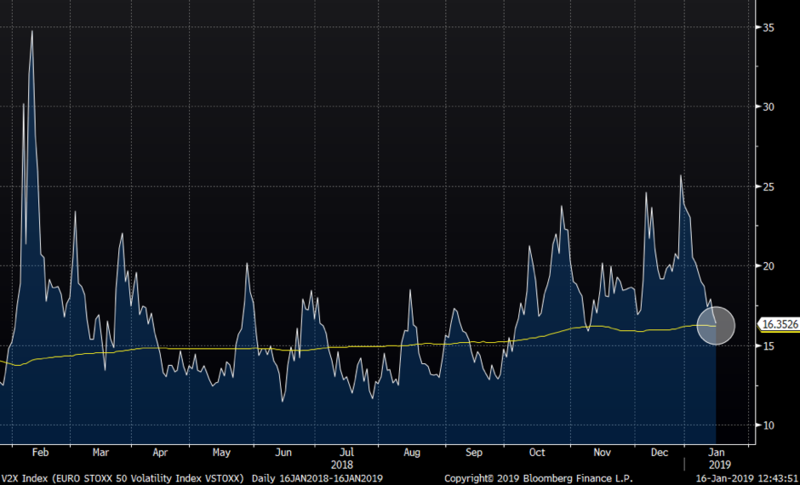 We can clearly see that recent implosion of vols has brought implied vols trading well below realized volatility (10, 30, 60 day realized vols shown by the other lines). 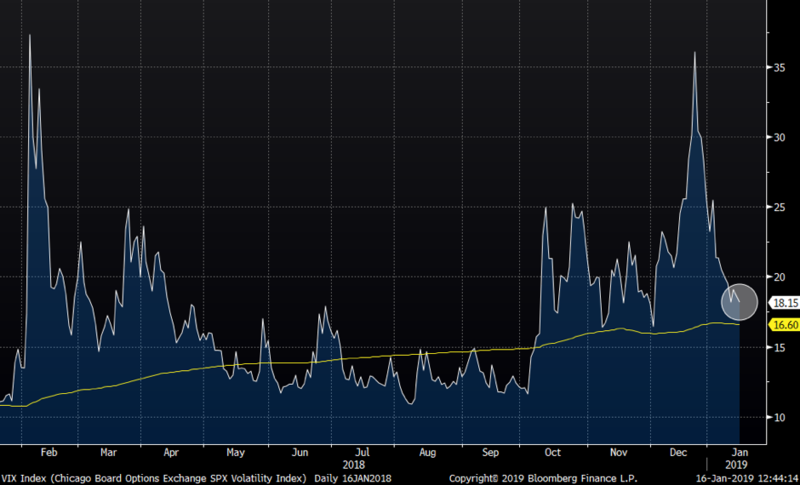 As we outlined a few days ago, longer term average of VIX is lower, but given the fact markets are at delicate levels and Q4 earnings are hitting the tapes as well as the global geopolitical situation still “not fixed”, long volatility strategies are becoming interesting again. Vol implosion since the Christmas panic. 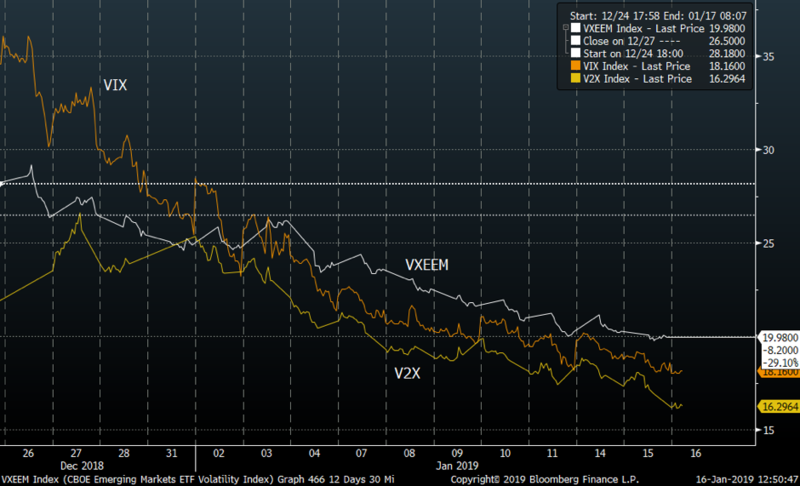 VIX, V2X and the Emerging market vol index, VXEEM. Not only have volatilities imploded recently, but credit markets have been moving lower as well. 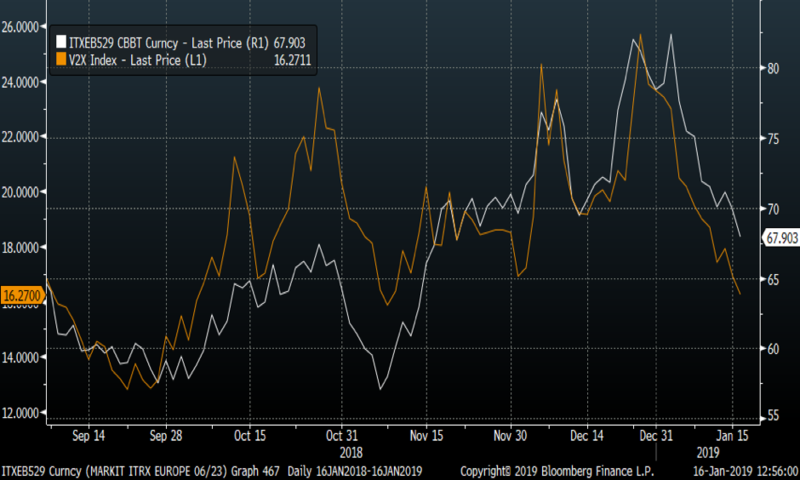 Below is the European iTraxx main (white) versus the V2X index. US CDX index (white) versus the VIX (orange). We suggested watching oil for “general” clues a few days ago. Oil was one of the big focus topics some weeks ago, but has since then ebbed out as a theme. The below chart shows US credit (white) versus the inverted oil chart (orange). To us, oil and credit remain some of the top risk indicators to watch.